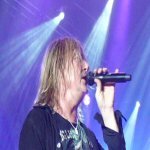 Def Leppard singer Joe Elliott has been interviewed by Planet Mosh radio and talked about the 2015 UK tour. Joe talked about playing in Belfast, an update on Vivian's health, the band's side projects, the Down 'n' Outz tour/band history, the band members, The Further Adventures Of... album, the proposed third album of original material, the 2015 Def Leppard studio album and world/UK tour. Joe now says the band will be back over to the UK in September before saying a UK tour will probably happen in November/December. Which would obviously suggest any Las Vegas residency may get pushed back until early 2016. Joe, Phil and Vivian have stated that the band will tour in Australia and Japan which seems likely to happen in the September/October gap after the US tour. "I think we start about 15th of April. There's festival dates being added as we go along. I think it's pretty much nailed down to about a month now. Then we go to the States for a couple of months. And then come September we'll be back over here hopefully - I don't know exactly when it's gonna be. But I'm guessing maybe November/December they'll be a British tour - British and Irish tour."